Ships Ahoy! Babies will be sailing away to La La Land with these gorgeous nautical inspired sleeping bags and buggy bags from uh-oh!. uh-oh! introduced their first range in 1994 and have gone from strength to strength since. All sleeping bags and buggy bags are designed by the experienced uh-oh! in-house team who really do know what works well for little ones and for parents. uh-oh! believe correct sizing is important to ensure the safety of your children so they offer a variety of sizes from 0 -6. All uh-oh sleeping bags and buggy bags comply & exceed the ‘Australian and New Zealand safety standard for children’s nightwear (AS/NZ 1249:2003), are machine washable and can be cool dried in the clothes dryer. We adore the fun and fresh designs of the uh oh! range, and the super-soft, easy-wash fabrics are an absolute blessing for parents. 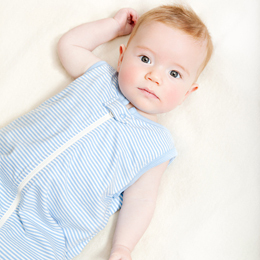 The large range of sizes ensures parents can find the perfect fit for their child to sleep safe. The smaller sizes are fantastic for babies who still need to be swaddled but wriggle out of their blankets and end up cold during naps and through the night. Uh-oh!’s buggy bags are perfect for little walkers who have just transitioned to their own big bed and tend to kick off the covers. They’re also convenient for those kiddies who creep out of their beds in the the night, or well before mum and dad are ready to open their eyes! In their snug buggy suit, parents can rest assured that kids are warm, have great ease of movement, and the added grip underfoot with help prevent slips on slippery floors. We found the buggy bags to be a great solution for comfort and warmth on those chilly morning walks. The pram harness fit perfectly around the suit and kept our blanket thrower toasty-warm. The 3.0 tog bags are brilliant for those freezing winter nights and are also available up to size 6 so can be used as a house suit for bigger kids. Zippers are safely tucked away under a protective cover, and we love the little tab feature with star embellishment that adds an element of urban-cool to these beautiful sleepy-time suits. For information and to purchase uh-oh! sleeping bags and buggy bags check out the uh-oh! website.